Kristian is happily married to Caroline and they have 4 amazing children and one fantastic son in law! He is the Lead Pastor of Arena Church a growing multi site church located in the East Midlands. He is a pioneering “big picture” leader that has seen numbers of new churches and campuses develop regionally and further afield into Toulouse France. Alongside the church an incredibly effective community programme that has over a 100 staff / volunteer positions, operates out of 14 buildings and serves over 5000 people each week. 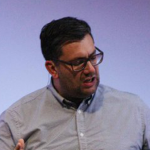 Kristian is the Church Planting Leader for the Assemblies of God GB and is passionate about the raising of new leaders, planting churches and transforming communities. He speaks widely helping leaders and churches to remove lids and limitations and think bigger!